Tony Pridmore is Professor of Computer Science at the University of Nottingham, where he leads the Computer Vision Laboratory. His research interests centre on image analysis and computer vision, particularly 3D reconstruction, visual tracking and their application to bioimage analysis and image-based phenotyping. Much of Tony's current work is directed towards the development of integrated plant phenomics technologies. He is a founder member of the University's Centre for Plant Integrative Biology and a co-Director of the Hounsfield Facility , a unique installation providing automated extraction of 3D structural descriptions of plants from X-ray data. 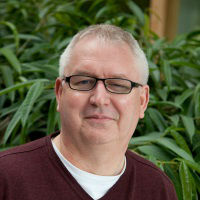 Tony co-Chairs the UK Plant Phenotyping Network and is a co-organiser of the Imaging and Image Analysis Working Group of the International Plant Phenotyping Network. Plant phenotyping - the automatic recovery of quantitative data on the structure and function of plants - is now widely recognised as the new bottleneck to global food security. While techniques for the study of the genome are well-developed, tools characterising the phenome are in their infancy. A majority of phenotyping problems involve analysis of images of various kinds (colour, multispectral, microscope, X-ray, MRI), requiring close collaboration between computer, plant and crop scientists. This talk will introduce the phenotyping problem and motivate the identification of effective, efficient solutions; provide examples of image-based phenotyping techniques developed and developing at the University of Nottingham; and overview current directions and major phenotyping initiatives worldwide.